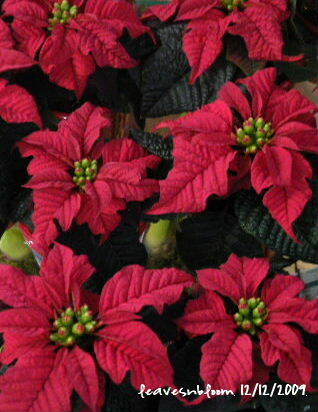 So who’s going to have a Poinsettia (Euphorbia pulcherrima) in the house this Christmas? or have you given up on trying after a few years of unsuccess. Does it start to develop those yellow leaves, then each morning you pick up the leaves its dropped during the night so by 25th December its just a few red bracts at the top and nothing but green stem below ………………. that you quickly dispose of in the compost bin before New Year? Well if you are one of those folk then you are in good company! Those festive bracts (coloured leaves) might look good in the shop till you get it home …maybe after you read this you might discover the reason why it has defeated you in the past and hopefully the notes below will help you succeed this time around. There are many things that can go wrong with a Poinsettia and some of those may not even be down to your aftercare. Damage can be done to these plants long before you even purchased it. So what can you do to make sure that the plant you buy lasts ? Firstly try and find out if the plants being sold are from Europe or from Britain. The British ones have been grown in our light levels – have had less stress in transportation probably being delivered from a nursery not too far away rather than being in a “clock auction” in Holland, then in a packing centre, then being transported to the port , then over the North Sea and then travelling to its final destination. Heated lorry or not – the length of time that plant is in that transportation could be detrimental to its condition. So if you are unsure ask someone in the shop which poinsettia’s were grown in the UK – they should be able to tell you. I am probably right in saying that most if not all supermarket poinsettias are european imports while large garden centre poinsettias have probably been sourced by a British grower. Another problem can be if the plant has been kept in the cold too long once its off the lorry. 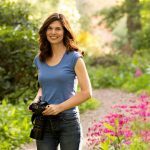 You will find that most garden centres will hastily bring their stock into the shop as soon as it has arrived and unpack from there rather than in a cold warehouse. You’ll also find that the British ones are probably that little bit more expensive than the imported ones but usually you are buying a stronger more robust plant. How to make that all important decision………… when you have about 100 poinsettias to choose from. Don’t buy a plant that is sold near a draughty spot in a shop or outside a florists door – Poinsettias hate draughty spots and they will show their disapproval very quickly. Alot of garden centres know where their hot and cold spots are and usually the Poinsettias are placed in the warmest parts of the shop where regular temperature checks are made throughout the day – so try to buy from those areas. Where their azaleas and cyclamen are placed should give you a clue as to where the cold spots are! Most diligent houseplant departments will be using lukewarm water to water their poinsettias as cold water will shock the plants and there is a possibilty that they won’t recover from that shock. (I’ve had people ask me if they can place them outside as some glossy magazines have featured them outside some famous folks front doors in pots………… please don’t do this if you live in the UK! ). Look out for nice dark green leaves that are sitting well on the plant rather than drooping and a well balanced shape that has leaves right down to the base. Sometimes the plants are still in their sleeves – so try to take off the sleeve to check the condition of the leaves at the lowest level and don’t buy one that has yellow leaves. If a plant has been left in its sleeve too long – the ethylene gas builds up and it makes the plant drop its leaves far too quickly and makes the leaves curl – some suppliers have holes in the sleeves to try to prevent this from happening. Sometimes its not a bad thing to have the sleeve around the plant as its giving it a little more protection from the cold ……….just not for too long. If the plant is wilting in the shop and its got soggy compost – leave it well alone. 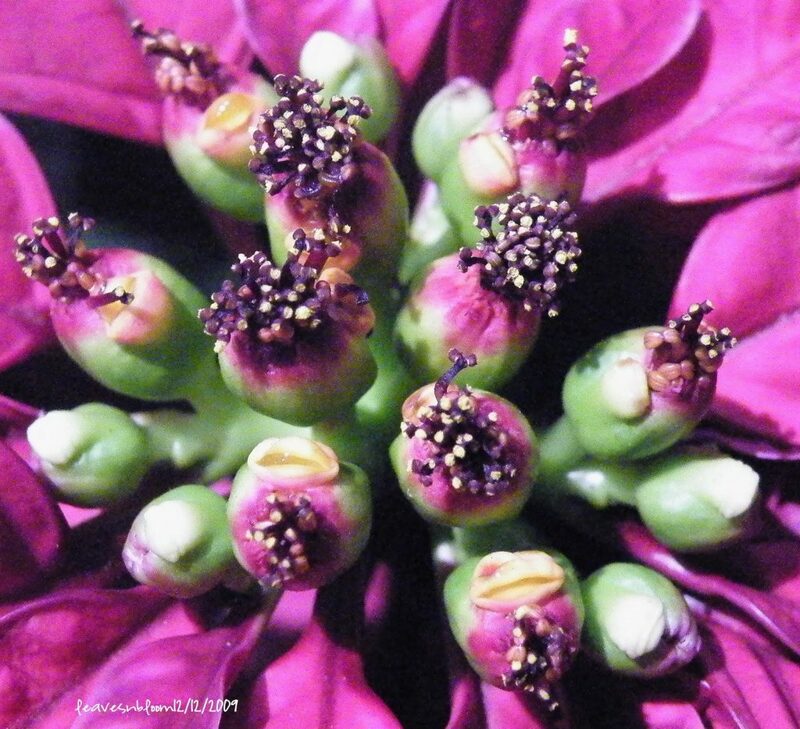 Poinsettia flowers (cyathia) are tiny – all of the colour is in the leaves (bracts). 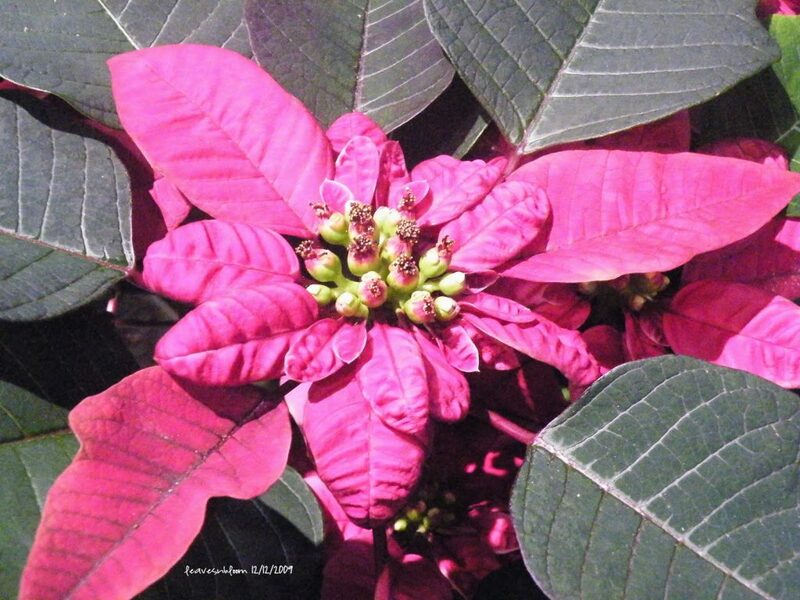 When buying your plant check out those little flowers – if the poinsettia is in full bloom then all those little yellow flowers will have opened out – so try to buy a plant that has many of them still to open. When a poinsettia has past its best those little flowers fall off so checking for those flowers is a good way of telling if the plant is past its prime. What I have found is that a few of the newer varieties have very few cyathia so its not a foolproof test. 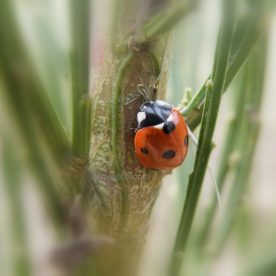 You should not have to worry about pests or diseases on the plants if you are buying from a reputable source – spot checks are done on poinsettia plants by DEFRA at uk ports and nurseries and spot checks are even done in retailer stores also by inspectors. Always best to check for bugs none the less especially once its been in your home for awhile. But once you have bought your plant – don’t leave the shop without it being placed in a sleeve – plus make sure you don’t leave it in the car for long and not in the boot (trunk for my US readers) and get it home as quickly as possible. Leave your purchase of Poinsettia last on the shopping list that day. If you are getting your poinsettia giftwrapped in the shop as a present for someone – make sure the shop don’t completely cover the plant with gift wrap if its going to be a few days before you give the present to the recipient. The plant could droop after 48 hours inside the cellophane. Keep it away from draughts, don’t let the bracts touch a cold window pane for any length of time as that will damage the leaves, Night temperatures should be no cooler than 60 to 65 degrees F and Day temperatures should not exceed 80 degrees F as they also detest excessive heat. And if the curtains are closed at nightime take the plant into the room away from the window sill. Any rapid temperature fluctuations will cause premature leaf drop. Keep it away from heated appliances, tv’s, computers and radiators. Get the plastic sleeve off the plant so that the roots can breathe and gases can’t build up. Place the plant somewhere nice and bright during the winter months and keep an eye out for bugs as the weeks go by. Don’t let it sit in too much sunlight during the day as it is a bit fussy about that too! plus the bracts start to fade. About 2 hours of sunlight a day is recommended but if you live in the UK 2 hours of bright sunlight a day in wintertime is quite rare! If it is placed in too shady a position it will also loose some of its leaves. If you get the watering right – then you should succeed. Check for water every day and when the compost is dry to touch on the surface its time to water – making sure that you give the plant enough luke warm water to make some run out the bottom of the pot – drain away the excess and don’t leave it sitting in a saucer of water. 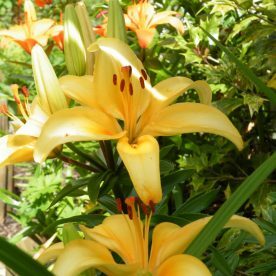 Sometimes the plant might droop if its been kept too dry – normally there’s a window of opportunity here if you catch it quick enough – place the plant in a shady spot sitting in luke warm water for quite a few hours and it should revive itself. I’ve done this on so many occasions and it does work but it will probably drop a few of its leaves in protest at being left too dry. If its drooping and the compost is soggy – sorry but that plant is only fit for the compost bin. I’ve never seen one recover from that and I have watered thousands of them over many years. Best to water in the mornings rather than in the evenings. Many people don’t realise how hungry these plants really are – while in the nursery they probably have received all their nutrients from the compost in the pot but once you get it home feed it once every 2 weeks with a good general purpose houseplant food or look out for a Poinsettia drip feed that many garden centres sell these days. Just unscrew the top, pop the tube of feed in the pot and the plant feeds itself! and replace the tube once empty. Just make sure you have a tiny hole in the tube so its doesn’t all run out at once and damage the roots. The feeding also helps prevent the leaves from going yellow. I am very cautious about suggesting misting – I do it but not as much as what I would do with foliage plants. 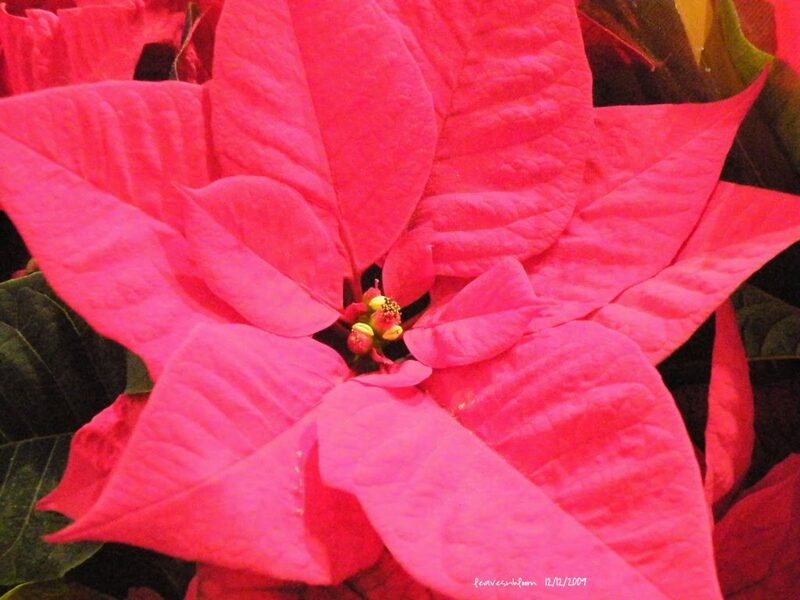 Its certainly advisable if your poinsettia is in a centally heated room as they don’t like dry air and the edges of the leaves will go black and cripsy so alittle extra humidity will help them. I would do it morning times rather than in the evenings and I would rather mist more of the green leaves rather than the red bracts. I normally just lightly spray the air above the plant and hope that that is just enough extra humidity for the red bracts. You will notice the white sap that seeps from the slightest wound in the leaf or stem. I’ve always been told to wash my hands once I have come in contact with the white sap from the plants. I was reading recently that about 8% of the population have an allergy to latex – and out of that 8% – 40 % of those people have an allergy to poinsettia sap. 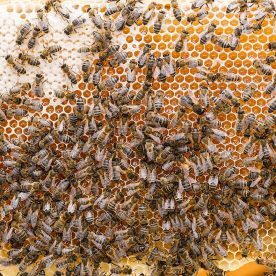 Every time those people come in contact with the sap their allergy gets worse so eventually coming in contact with the sap could put the person into anaphylactic shock. So Christmas shopping from Novemeber time is not the easiest of things for these people when they have to carry an adrenalin injection pen just incase they come in contact with a poinsettia in a shop or in someone’s home. 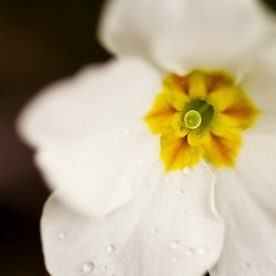 For all the rest of us who don’t have that allergy just don’t let any of the sap get into your eyes or mouth as its an irritant and best to keep young children away from the plants as they will find that oozing milky white sap quite intriguing. Plus its best to keep it out of reach of any pets you have in the home. The plant is not poisionous but as you can see a few can have severe reactions so its best to be cautious. They are also known also known as the Mexican flame leaf, Christmas star, Winter rose, Ataturk flower, Noche Buena or Pascua depending on where you live in the world. There is alot of folklore about the plant, the Mayan Indianians believed that the plants where creatures more powerful than themselves from another world and they were central to their creation legend, the Aztecs believed that the plant was a symbol of purity and in Mexico legend says that a little child was walking along the side of the road and as she could not afford a gift for Christ she picked up some weeds and brought them into the church and as she entered they blossomed into red and green flowers. The plant is a native species in Mexico and grows wild there as well as in Hawaii and other parts of South America and Africa. Have you ever seen a wild poinsettia ? I’m sure many of you have in your travels. I was shocked the first time I saw one in our hotel complex while on holiday years ago tho it was growing in North Africa rather than South America – it was about 8 or 9 feet tall and it had red bracts and they were not big coloured bracts either. The poinsettias we buy are treated with a dwarfing agent that keeps them small for the seasonal market. That dwarfing agent only lasts one year so if you keep it from one year to the next it will get taller and taller without some pruning. They come nowadays in all sorts of colours whites, pinks, marble effect, burgundy, orange and apricot as well as the traditional red these days ………………. and then we have the dyed blue ones and the ones with glitter (not my choice thats for sure! ). This year I do like the pink ones and have noticed over the past few weeks how strong, sturdy and robust they have been tho they are not as popular as the red ones. 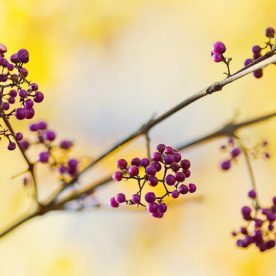 What’s in bloom in November? Delighted to see another blog from Scotland. 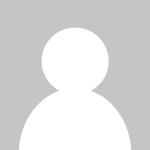 I, too, found you on Blotanical. Thank you for this excellent tutorial. 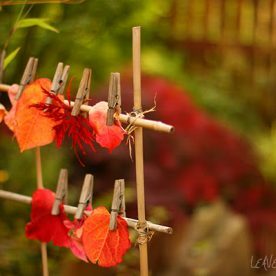 I saw poinsettias growing and blooming as 5-foot 'trees' on the blog of a Vietnamese garden friend this morning. wow great post. Very informative. I too agree with nell jean. i saw them growing more than 6 feet tall in an exhibition last week. Thanks Muhammad, Nell Jean and Alice glad you enjoyed the post. Great information, what a thorough article.